The manual can be purchased with two MP3 CDs or with a CD-ROM and two MP3 CDs. 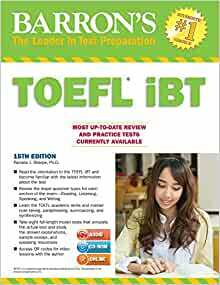 The CD-ROM presents iBT versions of the book’s 7 TOEFL practice tests plus an additional TOEFL iBT. The tests on the CD-ROM simulate actual test-taking conditions. The MP3 CDs present audio prompts for the Listening, Speaking, and Writing sections of all TOEFL practice exams and exercises in the manual. Loved it. It comes with one CD Rom which includes 8 tests and also other activities for toefl IBT test. It also has 2 other MP3 cds for the listening improvement. Over all it’s a 5 star book for toefl IBT prep. one of the best TOEFL practice books out there! Also good for teaching. Questions are not good for studying for the actual TOEFL. They are not c/w the formal or degree of difficulty used by ETS. Today got Toefl ibt book with 2 cds. As description CD ROM should be there but it is not there . So little disappointed.Book quality is very good .